Great for parties; just multiply the recipe and make in a jug or punch bowl. 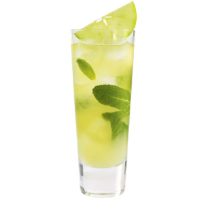 Sqeeze the lime into a tall glass, then muddle together with the mint leaves. Add ice cubes, rum and apple and ginger juice and top up with soda ater. Garnish with a slice of apple.